Ed Haley’s roots, at least on his mother’s side, originated in the high mountains of Appalachia somewhere in that wild section of country situated along the Virginia-Kentucky state line. Peter Mullins, Haley’s great-grandfather, was born around 1804 in Kentucky or, according to one source, in North Carolina. The son of a notorious counterfeiter, “Money Makin’ Sol” Mullins, and reported descendant of those mysterious people the Melungions, Peter chose for his wife Jane Mullins, a first cousin. Between 1830 and 1858, he and his wife had at least eleven children. The sixth child, Andrew Jackson Mullins, was Ed Haley’s grandfather. Peter and his wife initially lived in Pike County, Kentucky, near Clintwood, Virginia. Based on census records, the family remained in Kentucky throughout the 1830s. Family tradition, however, states that Peter relocated to Marion County, Tennessee, due to his involvement in a counterfeiting operation. Around 1841-42, he traveled north to Upper Hart in what was then Logan County, Virginia, and settled near a sister, Dicy Adams. In 1842, he bought 25 acres of land from Abijah Workman and Mekin Vance on Hoover Fork. Deed records indicate that he operated a mill on Hoover. Two years later, he acquired 50 acres on the “first lower branch” of Trace Fork. There are no stories chronicling Peter’s life on Harts Creek, nor any photographs to reveal anything about his physical features. All we have are census records and deed records — somewhat dry but noteworthy. In the 1850 Logan County Census, he was 46 years old and had 200 dollars worth of real estate. Three years later, in 1853, he bought 40 acres of land on Hoover from John and Sarah Workman and 37 additional acres on Trace. That same year, he sold a 35-acre tract (that included a “mill built by Mullins”) and a 25-acre tract on Hoover to son-in-law Barney Carter for 400 dollars. In 1854 he bought 30 acres on the Gunnel Branch of Trace Fork and another 1/4 acre on Hoover from Carter. On this latter property, he acquired a mill and dam, referenced in the deed. Three years later, he purchased three tracts of land totaling 97 acres on Trace. In 1858 he sold land on Hoover to son-in-law Mathias Elkins for 400 dollars. The next year, he sold a small acreage on Hoover to Carter for 100 dollars. In 1860, Peter appeared in Logan County Census records as 54 years old with 1,500 dollars worth of real estate and 2,000 dollars worth of personal property. In 1869, he bought 29 acres from Elkins for 100 dollars located “10 poles above the Alfred Tombline House” on Harts Creek. In 1870, 63-year-old Peter Mullins appeared in the Logan County Census with his wife Jane and four of their children. Within in the next few years, Jane Mullins died. In 1874, Peter remarried to the much-younger Elizabeth (Johnson) Bryant and settled on Buck Fork. That same year, he sold a tract on the Bills Branch of Trace to son-in-law William Jonas, then bought 50 acres of land on Harts Creek above Lick Branch from Carter the following year. The 1880 Logan County Census listed him as a 68-year-old farmer; his wife Elizabeth was aged 40. That same year, he sold 80 acres on Trace to son Jackson Mullins — Ed Haley’s grandfather — who simultaneously sold him 50 acres of land on Buck Fork for 600 dollars. In 1882, he bought surface rights to a 100-acre tract and a 30-acre tract on Buck Fork and a 25-acre tract on Trace. Thereafter, in 1883, he sold 35 acres to son Solomon Mullins on Buck Fork for 250 dollars and 20 acres to Mary D. Mullins on Trace Fork for 100 dollars. In 1886, he sold 30 acres to Dicy Blair on Buck Fork. 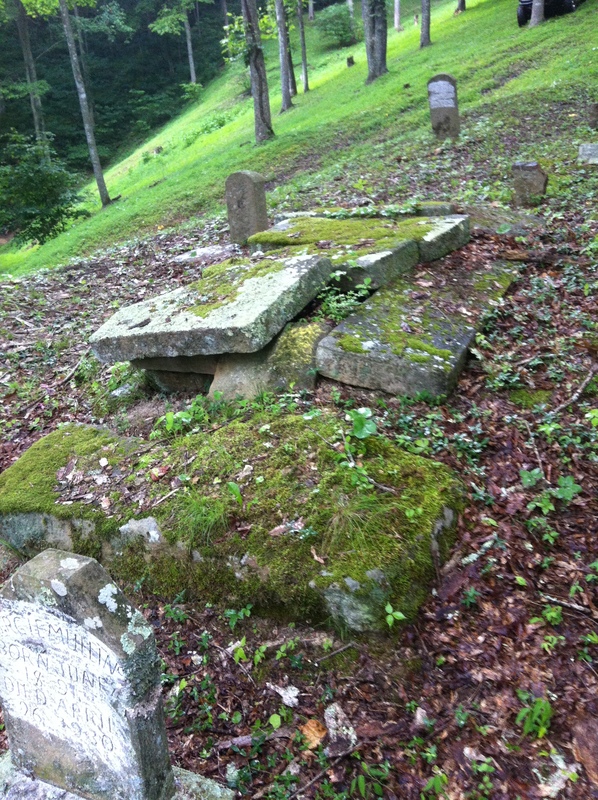 Peter died around 1888 and was buried on Buck Fork under a large stone slab. In March of 1889, just a few months before the outbreak of the Haley-McCoy trouble, his heirs sold 20 more acres of his property on Buck Fork to Dicy Blair.